Maintenance is our core business. Our people and processes are all focused on delivering a fast and cost effective service in industries where uptime and compliance are critical all day, every day. With experience in specialist areas and a team of engineers, project managers and site crews with an ethos of continuous improvement, we take pride in adding value where we can. Through design improvements, predictive maintenance, and increasing the efficiency of plants, our experience in working with a broad array of equipment allows us to do much more than simply get equipment back into service quickly and safely. We also supply and maintain the following engineering products: compressors, blowers, water & wastewater equipment. Unplanned downtime costs money and reputations. We measure key parameters like vibration and temperature to more accurately predict maintenance requirements, allowing time to plan for a shutdown. With often only very short windows in production to take advantage of, precise coordination with clients, contractors, safety specialists and suppliers is essential. We have been entrusted for many years by blue chip manufacturing companies to carry out critical planned preventive maintenance, upgrade and renewal works. With a focus on planning and safety, we prepare detailed Risk Assessments and Method Statements well in advance and ensure all equipment is fully certified for safe and effective site operations. We have a fleet of fully equipped service vehicles for fast and efficient response to your site maintenance requirements. Our service vehicles carry fully certified safety equipment, lifting gear, specialist tools and hygiene facilities for safe site working. FIN Maintenance is a provider to Northern Ireland Water for the Mechanical Installation and Repair of water and wastewater assets across the whole of the country. Our locally based crews can respond to high priority call-outs within 2-hours anywhere in Northern Ireland. FIN can provide a full range of compressed air equipment to match you compressed air service requirements. Our installation team will install compressors, refrigerant dryers, desiccant dryers, air receivers, pressure reducing stations, ancillary equipment and complete piping distribution systems to your production points of use. 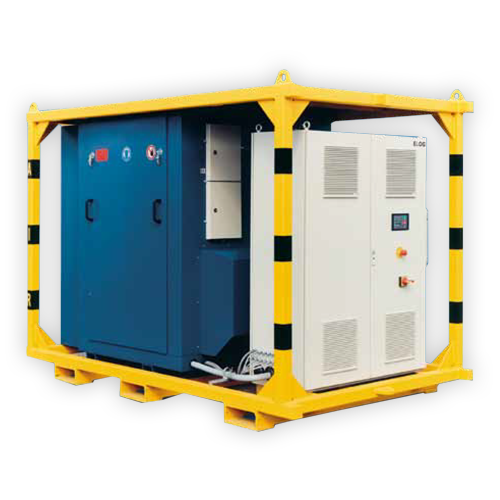 Compressors, receiver and dryers can be supplied as a complete skid mounted package preassembled and pre-tested for fast site hook-up and compressed air ON. 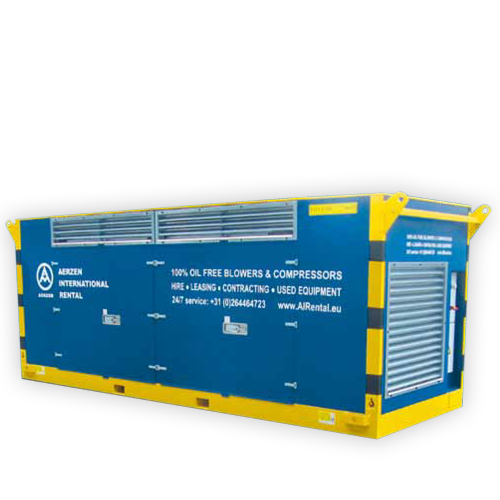 Pre-assembled skid mounted compressed air package comprising BOGE rotary screw compressors with VSDs, integral refrigerant dryers, air receiver, desiccant dryers and associated piping supplied with a 5-Year Warranty. 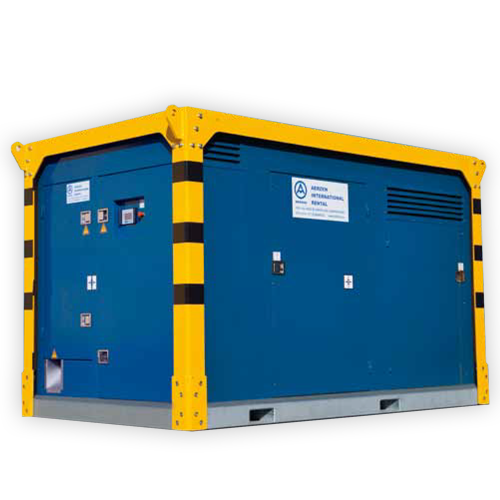 The compressor skid was installed to replace existing equipment during a one hour shutdown window – faster, safer, better! Did you know...that reducing the operating pressure of a compressor by 1bar can save some 6% in energy costs! As part of our plant optimisation service we will determine the optimum pressures to generate, distribute and use compressed air depending on you specific production requirements. FIN can provide Aerzen blowers on HIRE. Aerzen blower packages are available at FIN’s Belfast depot for same day delivery. The blowers are oil free with single unit volume flow rate up to 5400m3/h and up to 1000mbar overpressure. For flowrates greater than 5400m3/h multiple blowers can be supplied. The blower packages are supplied with variable speed drives to adjust to site requirements. The FIN team along with Aerzen International Rental can prepare contingency plans for the rapid installation and hook-up of hire blowers for strategically important sites to ensure compliance. Even with the most rigorous planned preventative maintenance regimes, failures and unplanned outages will still occur. In such time-critical situations it is simply not feasible to wait a number of weeks for OEM parts. Our well-equipped machine shop can manufacture the most complex of parts/assemblies in a fraction of the time required to obtain OEM parts, and help bring your production back on line in the shortest time possible.